Another video (and panorama) of the giant Ginkgo tree, Iwadono-kannon, Shohoji Temple at Higashimatsuyama, Saitama Prefecture, Japan. Said to be 700 years old. Click here to view an enlargement. 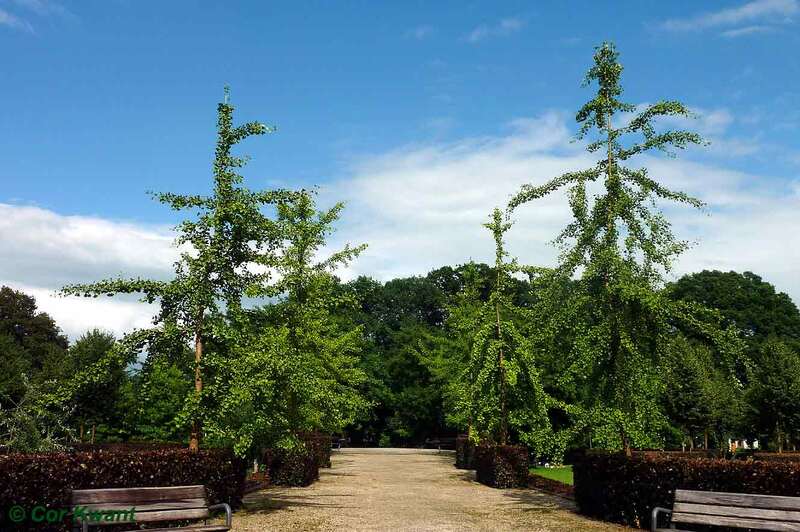 These Ginkgo trees grow at Cemetery Kranenburg (Hagenpark area) in Zwolle, the Netherlands. I took this photo last week when the sun was shining for a while on a rainy day. They are situated on the so-called Parnassusberg, an elevated vantage point named after the Greek mountain Parnassus, symbol for the habitation of the Muses. It is composed of two terraces surrounded by hedges. The circular shape of the mountain symbolizes the all-encompassing. * New photo on Photospecial page: Ginkgo leaf. * New topic: 2nd generation A-bombed Ginkgo tree to be planted by UNITAR.